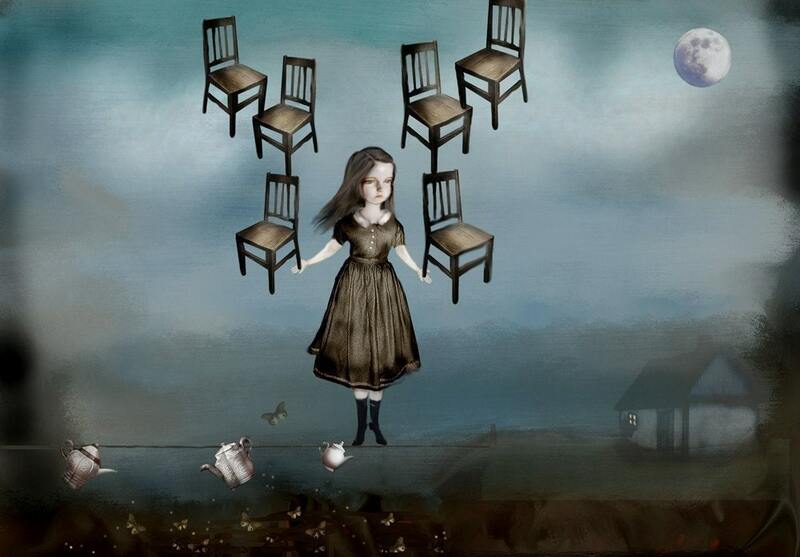 Karen Preston of A rabbit girl creates art that is dream-like, whimsical, magical, slightly dark, and a little edgy. I saw the pictures of Maurice Sendaks Where the Wild Things Are when I was smaller than I am now. I fell in love with the monsters. The rest is history. Just one favorite thing? I suppose I have to say creating. Not just art either. My daughter is my favorite "handmade" thing. Printing. If someone else would drag out my huge Epson from under my daughters bed and put it on rollers then push it down the narrow hall past the awful hall rug without knocking it off the rollers for me I would be forever in their debt. Winkin, Blinkin, and Nod at the moment. My favs change with every one I create though. A mommy and an artist. Also at one point a veterinarian. Karen also does wholesale and custom work. Custom work involves sending her your images, mixing those with her images and coming up with something magical. Here is an example of a custom banner she created for the shop Twigs and Heather. Visit A rabbit girl today at Etsy or 1000 Markets.